Even after he’d been shot 16 times and lay dying on Pulaski Road, Laquan McDonald still posed a threat to Chicago police officers because he held a knife in his hand. That’s what the partner of Jason Van Dyke testified during the second day of arguments in the high-profile murder trial. Former Officer Joseph Walsh, who was partnered with Van Dyke on Oct. 20, 2014 when Van Dyke shot and killed McDonald, was one of five current or former Chicago Police Department personnel who testified Tuesday. Van Dyke is charged with first-degree murder after shooting McDonald during a police call on the Southwest Side. He also faces 16 counts of aggravated battery and one count of official misconduct. 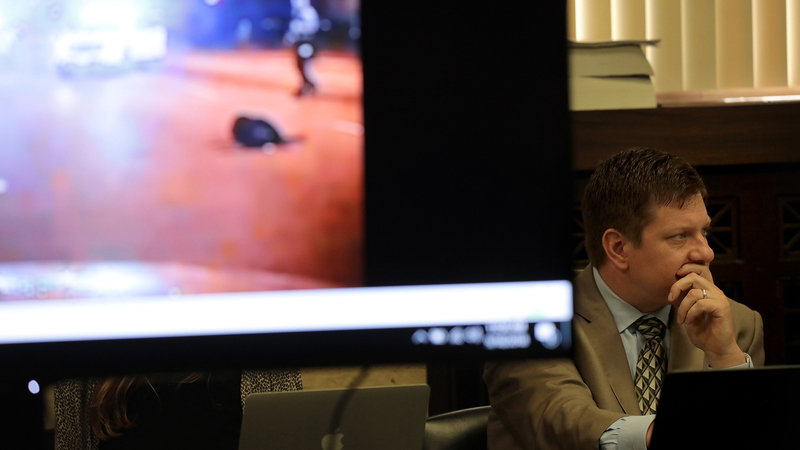 Prosecutors have painted this as an unjustified shooting while the defense says Van Dyke acted within the scope of his training. Walsh admitted on the witness stand he was “startled” when Van Dyke fired his first shot at McDonald, but contends the teen raised his knife to shoulder level and remained a threat to officers until the knife was out of his hand. In a surprising move later in the day, Cook County Judge Vincent Gaughan tossed prosecution evidence and struck a witnesses’ testimony from the record, saying it wouldn’t help jurors better understand what was happening at the time of the shooting. Below, updates from day two of the trial. Get updates from day one here. Jurors watched dashcam footage of the shooting several more times – but slowed down to one-quarter speed. FBI audio/video analyst Mark Messick testified that he created “enhanced” versions of the original video by slowing down portions of it and adding green arrows to depict bullets as they hit McDonald’s body. He also added an oval shape around McDonald to highlight him as he walked down Pulaski Road and fell to the ground. But jurors won’t be able to consider that evidence in their deliberations: Gaughan struck the video and all of Messick’s testimony from the record. Defense attorney Daniel Herbert argued that Messick is not an expert in ballistics and couldn’t testify about what was going on in the video. Messick testified that he couldn’t say with certainty that the arrows in the video were 100-percent accurate. The judge agreed with Herbert and said the enhanced video does not help jurors better understand what they were seeing at the scene. Chicago Police Detective Roberto Garcia, who was assigned to investigate McDonald’s death, testified that he and an evidence technician recovered Van Dyke’s Smith & Wesson semiautomatic handgun at a police station in the hours after the shooting. That gun was shown in court, along with the fully loaded magazine of 9 mm bullets that Garcia recovered with it. Van Dyke’s attorneys had previously try to bar prosecutors from mentioning at trial the fact that Van Dyke had reloaded his weapon after shooting McDonald 16 times. On cross-examination, Garcia also testified that it’s standard procedure during this sort of investigation to recover the weapon used in any police-involved shooting. Following that testimony, retired Chicago police Officer Victor Rivera took the stand to discuss additional metal bullet fragments he inventoried at a hospital following an McDonald’s autopsy. Officer Kamal Judeh, an evidence technician with the Chicago Police Department, testified about how he processed the scene on South Pulaski Road and located various bullet casings and metal fragments after McDonald was shot in October 2014. Jurors were also shown dozens of photos and a video Judeh took at the scene the night of McDonald’s death. They depicted those fragments and casings surrounding two pools of blood on the pavement while a knife lay nearby. Jurors also saw images of the clothes McDonald wore the night of his death, including underwear and a black hoodie that appeared to be stained with blood. Chicago Police Officer David Ivankovich, who was up first, was shown dashcam footage from his squad car as it raced toward 41st Street and Pulaski Road following a “hot call” that an officer was in need of help. Ivankovich and his partner were armed with a Taser. As another officer testified Monday, police near McDonald were “trying to buy time” until the Taser arrived on the scene. Ivankovich testified that he was around 59th Street and Pulaski when he learned that shots had been fired. About one minute later, he was at the scene of the shooting as footage from his dashcam showed McDonald laying on the ground. Adam Murphy next took the stand. He’s an officer with the Cook County Sheriff’s Department who was on Cicero Avenue the night of the shooting when he saw Chicago police squad vehicles heading to McDonald’s location. Murphy said he followed the officers to 41st and Pulaski where McDonald lay on the ground. Murphy testified that he put on rubber gloves and planned to give first aid to McDonald. He heard McDonald “gasping for air and gurgling” and told the teen an ambulance was on the way, but received no response from McDonald. Xavier Torres, a 26-year-old utility worker, testified that he had an unobstructed view of McDonald being shot. Torres and his father were heading to the hospital the night of the shooting, and during their trip, they came across McDonald and police officers on South Pulaski Road. Torres said he never saw McDonald make any threatening movements toward officers and that he appeared to be walking toward a fence outside a nearby construction area – not toward officers Van Dyke and Walsh. On cross-examination, defense attorney Randy Rueckert questioned Torres about an interview he gave to FBI officials months after the shooting. Torres admitted it had been a long time and he didn’t recall exactly what he told the FBI. “It’s been awhile,” Torres said. Rueckert responded that it’s been awhile since the shooting, too. He was shown dashcam video of McDonald being shot and testified that he believed the teen still posed a threat as he lay on the ground after being shot because he still had a knife in hand and was “moving.” He also admitted he was “startled” by Van Dyke’s first shot. Walsh repeatedly said the dashcam video didn’t reflect what he saw from his perspective on the scene. He also demonstrated to the jury how he saw McDonald raise the knife to shoulder level and look at himself and Van Dyke “with a stare and focus beyond us” at the time of the shooting. Walsh testified under a grant of use immunity, meaning anything he said on the stand cannot be used against him in any other case. He and two other Chicago officers face charges stemming from an alleged cover-up of what happened on the night of the shooting. Tuesday’s hearing began with Gaughan questioning each juror about whether they have spoken with anyone or heard anyone talking about this case in their presence. One juror said her brother-in-law was speaking about the case near her, but she asked him to stop. That juror was then asked to look at Van Dyke and the prosecutors and say if she could still give them a fair trial. She said she could, and remains on the jury. The trial will resume Wednesday morning at 10 a.m. Find full coverage of the trial here.